Depending upon who you talk to, the word "jerky" is believed a corruption of the Incan word "ch'arki" (which literally means "dried meat) or a corruption of the Quechuan Native American word "Charqui" (which means "to burn meat"). Whatever the case, for thousands of years, humans have prized jerky because it made meat last longer (before the days of freezing, refrigeration, and canning) and was light and easy to carry while traveling. Jerky is still a favorite snack. Just like our ancestors, we like to bring it when we're on the go. It's also a great way to make tough or gamey meat much more edible. Some people worry about the nitrates in jerky, but if you read this blog, you know you get more nitrates from eating arugula. Commercially prepared jerky, however, is full of chemical preservatives and GMO ingredients. Plus, it's expensive. So there are several good reasons for making your own. At our house, my husband usually makes the jerky. He uses the traditional method: A smoker. I'll type about this process soon. But today, I want to share an alternate way to make jerky - a method that's perfect for those without a smoker or smoke house: With a food dehydrator or oven. Years ago, when I got my Nesco American Harvest food dehydrator (which I highly recommend, by the way), it came with Nesco's jerky gun. Because my husband usually makes jerky, though, I never used it...until recently. 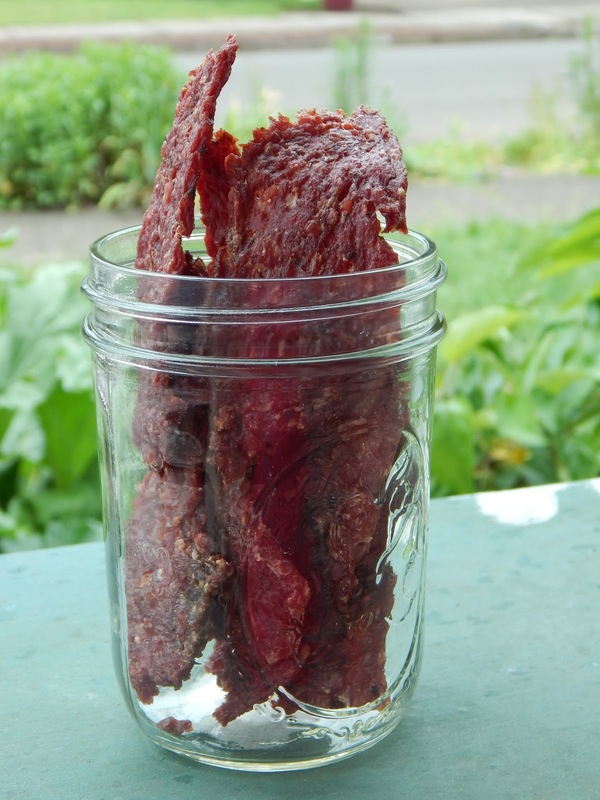 I do think my hubby's jerky is better (because of the natural smoke flavor) - however, the jerky I make in my food dehydrator is more like what you buy in grocery stores. 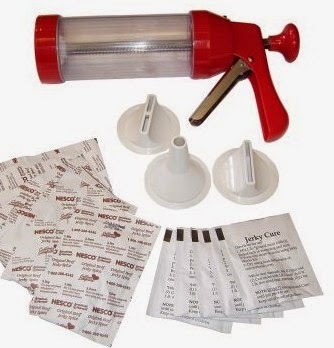 And the jerky making gun is a terrific way to use ground meat, rather than meat slices. And yep, this method covers up that gamey taste just as well as the traditional smoker method. An electric food dehydrator: Could you use a solar dehydrator? I suppose you could. But it will take forever and the longer the meat sits out, the greater the risk of food poisoning. Especially if you use a jerky gun, using an electric food dehydrator is a quick operation. I did five trays of jerky in about 5 - 6 hours. A jerky gun: Only needed if you're using ground meat. (Otherwise, you just need a sharp knife; be careful!) My Nesco jerky gun works really well, and it gives the option of making round Slim Jim style sticks; wide, thin pieces; or narrower, thin pieces. There are other jerky guns out there, though. Jerky seasoning: You can buy jerky seasonings online or in some grocery stores, but do read the ingredients label. I have yet to find one that wasn't full of nasty chemicals or GMO ingredients. You can also make your own seasonings; the Internet is full of recipes! Here are some that are great for ground meat and a jerky gun. But when looking for jerky recipes online, be sure to note whether they are for ground meat or meat slices. Meat slices are usually marinaded overnight in something liquidy. If you try to use a recipe like that for ground meat, it will be too gooey to use with a jerky gun...and it will taste terrible. Trust me; been there, done that! Also, if your meat is gamey, you'll want a recipe with plenty of strong spices. Paper towels: For patting off fat from ground meat. Air tight containers: For storing your finished jerky. 1. If you're using meat slices, make sure they are very thin and that you cut off as much fat as possible. The meat will be easier to cut if it's a bit frozen. If using ground meat, it should be very lean. Grass fed beef or wild meat are perfect. 2. If using ground meat, mix the cure and the seasonings; with your hands, mix into the meat until well blended. If using meat slices, mix the marinade/cure in a Ziplock bag or airtight container. Add the meat, making sure it's well covered. Refrigerate overnight. 3. If using ground beef, load it in the jerky gun, according to the manufacturer's directions. 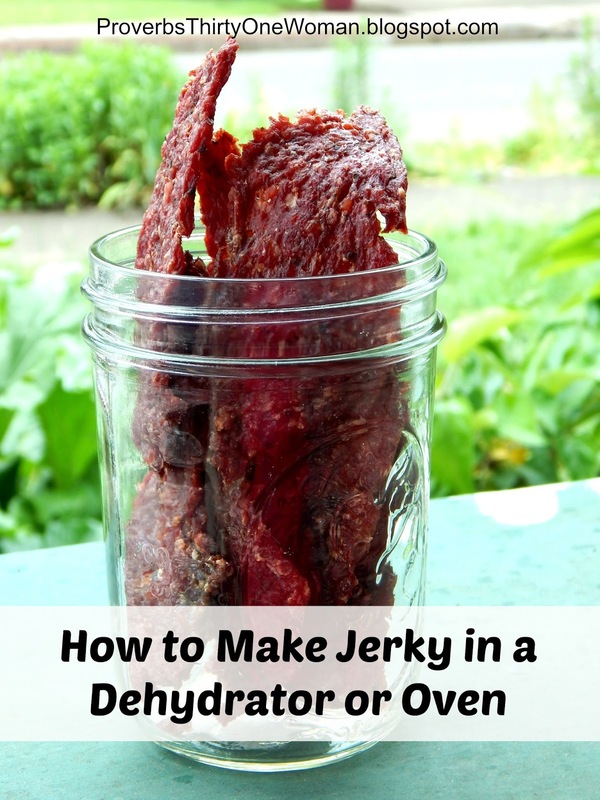 Squeeze the jerky directly onto the trays of the food dehydrator. If using slices, lay on the dehydrator's trays by hand. Either way, pieces should not touch each other, or they may become stuck together. 4. Set the dehydrator to 160 degrees F. After 2 or 3 hours, or at about the halfway point, turn the jerky over. If using ground beef, from time to time pat the jerky down with paper towels, to remove excess fat. Continue dehydrating until leathery. 5. Allow jerky to cool before putting in air tight containers. For jerky made from ground beef, wrap in paper towels and allow to cool for a couple of hours. This helps remove more excess fat - which improves shelf life. Remove paper towels and place jerky in air tight containers. Jerky should be either frozen or kept in the refrigerator. It's fine to keep the jerky unrefrigerated for a day or so - but it's not a good idea to keep it unrefrigerated for days. Remember that the less fat that's in the meat, the better the jerky will last. In addition, the more fully dry the meat is, the longer the jerky will last - yet super dry jerky is quite hard and difficult to chew. That's more like our ancestors ate it, but much less like modern day store bought jerky. Don't have a dehydrator? You can instead place the meat on a wire cooling rack placed over a rimmed baking sheet; put this in the oven on it's lowest setting. (If you have a warming drawer, put it in there, instead.) This doesn't work quite as well as a dehydrator, because the temperature is higher, but it still works!